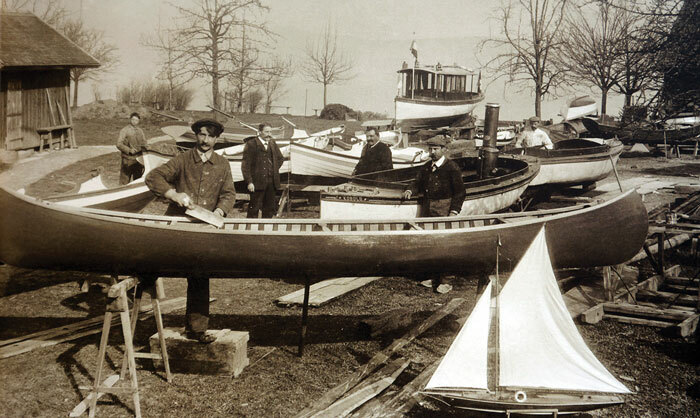 In 1914, Augusto Pedrazzini opened his boatyard in the Wollishofen district of Zurich, Switzerland, to build fishing boats and other small craft. In 1906, Augusto Pedrazzini, age 22, left his Lake Como home to try his luck working for the boatyards on Lake Zurich, in Switzerland. Augusto had learned his trade in Italy with master builder Giu-seppe Abbate and was a prized recruit. 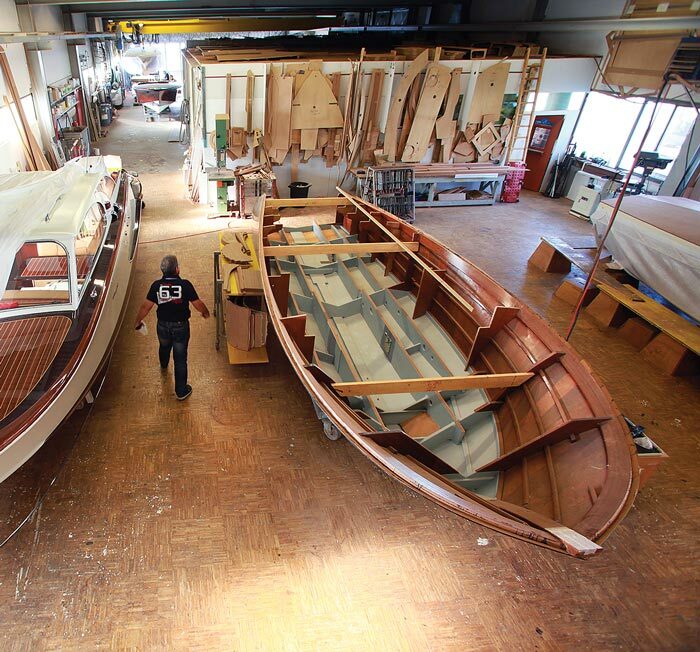 Eight years later, in 1914, he founded a boatyard near Zurich; today, his grandson, Claudio Pedrazzini, continues to build mahogany runabouts, continuing a century of Italian creativity imbued with Swiss stability. 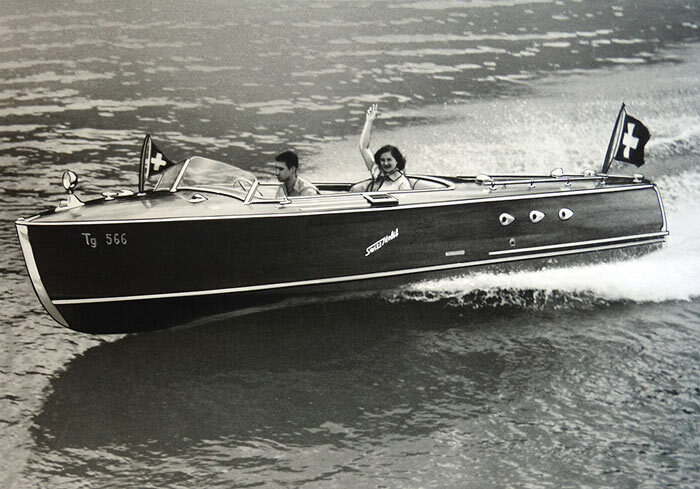 Ferruccio Pedrazzini and his wife testing the runabout Swiss Mobile, a model the company produced between 1932 and 1952. The Vivale, designed by Claudio Pedrazzini, retains the Italian styling for which the company is known. The thickness of the solid mahogany structural pieces in this Capri (7.47m/24’6″) ensures its long life. On the shop floor, framing is set up for a Special, the company’s largest model at 10.3m (33’11”); it takes about 4,000 man-hours to complete the boat, all in-house. 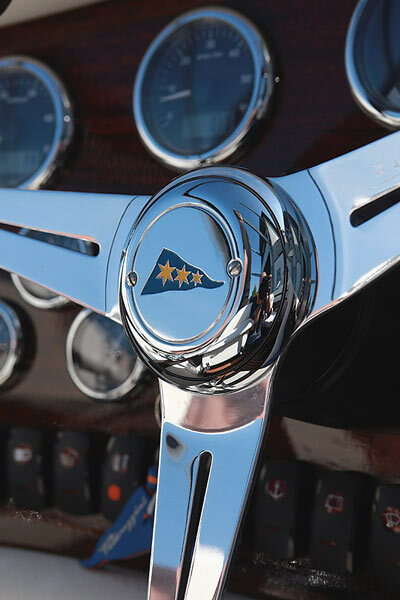 The steering wheel, made by Nardi in Italy, features an image of the three-star flag that flies on the flag mast. In 1956 the round transom became a trademark of a Pedrazzini and a sure way to identify one. Under the direction of Augusto’s son, Ferruccio Pedrazzini, the yard maintained the highest standards in selecting and assembling the wood, as well as in every visible and invisible detail. After the successful small dinghy Super-leggera was introduced in the mid-1950s, he launched the larger Capri runabout with its trademark rounded stern, and the model is still available in the company’s catalog. This pioneering feature provides easy access to the water for swimming and waterskiing. Then, in 1965, Ferruccio designed and built his first big twin-engine runabout, the Aquamar, and the model “surfed” the wave of popularity generated by Carlo Riva three years earlier, with his Aquarama (see “Two Steps Ahead,” Professional Boat-Builder No. 149, page 10). When Ferruccio died in 1993, Claudio succeeded him, with a twofold challenge: maintain the family tradition of solid wood construction and renew the appeal of its models, step by step. From the early 2000s, he decided to focus his range on three new models without breaking the continuity of style and features that had proved popular. Thus, the Capri 7.47m (24‘6“) starts a new career with its rejuvenated styling; and in the midrange, Claudio created the brand-new Vivale twin-engine 8.87m (29‘2“), named in honor of his two children, Viviana and Alessandro. At the top of the range is the 10.3m (33‘11“) Special, custom built to order. Prices for the basic V-8 gasoline versions are €270,000 ($297,000), €455,000 ($489,500), and €542,000 ($596,200), respectively, excluding taxes, options, and optional diesel engines. Pedrazzini boats are exported to the United States and Canada, and throughout Europe, from Finland to Austria and Sweden or France. One can search Pedrazzini in vain for technological novelties or fads. The yard lays claim only to being the best builder of traditional solid-mahogany runabout hulls. Everything is based on the quality of the types of wood and the exceptional care and time taken with each phase of production, from cutting the wood after its long, well-controlled drying period to the final assembly. 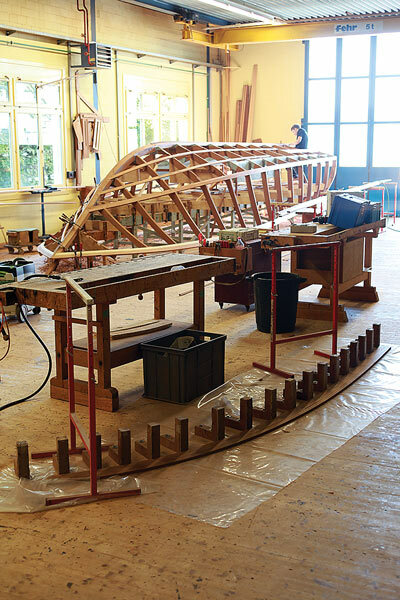 Practically every item is handmade, and it shows in the various workshops, where there is a subtle blend of rigor and pleasure taken in the everyday tasks of boatbuilding. Adequate supplies of mahogany are critical to ensure the final quality of construction and durability. The tree trunks, the most desired of them, are about 11m (36‘) long, very straight, and sourced from Africa. They are purchased in Germany before being shipped to Switzerland, where they are stored for Pedrazzini and dried four years. At the yard, the workshop keeps about a one-year supply of wood on hand. A typical Pedrazzini Capri, Vivale, or Special hull is built around a structure of sawn frames of solid wood. Then the hull skin is assembled on longitudinal battens 22mm (7⁄8“) thick. The hull sides are made of three consecutive layers in longitudinal and diagonal orientation for superior strength. The underlayer is 5mm (3⁄16“) thick, and the middle and final layers are 4mm (5⁄32“) thick, totaling 14mm (9⁄16“). 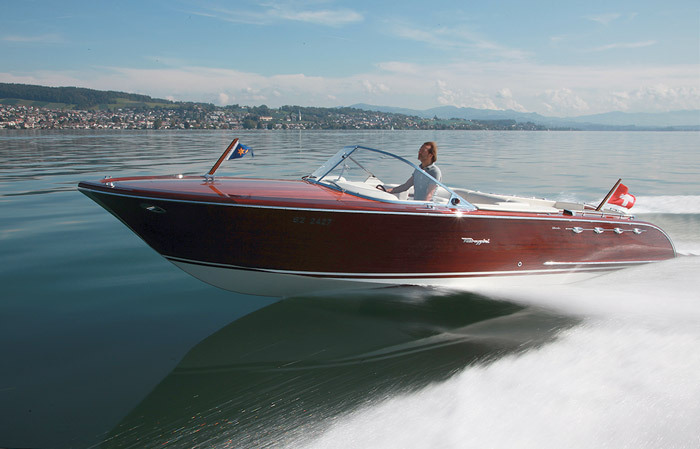 As for the hull bottoms, the Capri’s, for example, is made with special nine-layer mahogany plywood panels 12.5mm (1⁄2“) thick; the Special’s bottom panels are 15mm (19⁄32“) thick, consisting of 11 layers. Fifteen crew, including a few young apprentices, produce six to seven units per year, each requiring between eight and 10 months of work. Claudio calmly reveals that his order book currently represents no more than a year’s production compared to the two or three he had on the books before 2007–08. Fortunately, the boatyard also permanently stores and maintains around 30 runabouts, not to mention doing restorations, while its marina is equipped with 32 moorings. The prosperity of the region and the Germanic customer loyalty are reasons to be confident of the future. 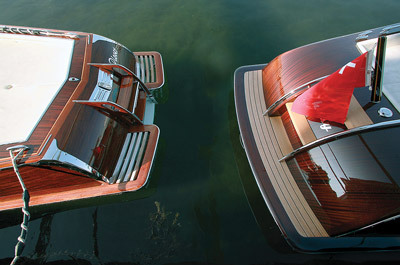 During the past hundred years, the Pedrazzini family has built about 2,000 boats of all kinds. The regular numbering of the hulls in chronological order was introduced in 1958 by Ferruccio, and the latest Pedrazzini under construction bears the number 1155.